River Fly Fishing Tuition and Guided days are available across the Southwest on all manner of waters from freestone spate rivers to beautiful chalkstreams and for a range of species including brown trout, grayling, salmon and seatrout. Below are just a few examples of river days, get in touch with details of what you would like to do and I can put together venues and costs for you. Fly Fishing Tuition & Guided Fly Fishing days on over 3 miles of a truly wild small stream near Bath with brown trout running to over 2lb and chub to 4lb. A lovely mix of shallow runs and deep pools, this small stream holds loads of surprises but is very overgrown so don’t expect to be using the overhead cast much, it will all be about roll casts, side casts and the bow and arrow cast. Short rods and short casts are the order of the day. You will need to be reasonably fit as the banks are steep in places and access into the water can be a little tricky but well worth the effort. This fishing is all about stealth and stalking the quarry, so if you fancy river fishing with a challenge then this day is for you. Given the right conditions there is also a reasonable Mayfly hatch through May and June. All tackle for the day is supplied if required or bring your own if you prefer. All you will need is a valid environment agency rod license and chest waders if you have them, although I can arrange for the supply of waders if required. A guided day on this river with instruction will cost £130.00 for one person or £180.00 for 2 people or ½ day for one person at £80 and £110 for 2 people. Available in season from 1st April to 15th October. 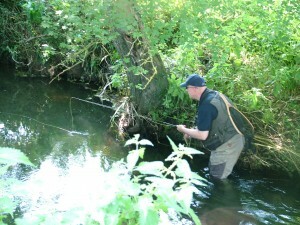 I now offer guided fishing for salmon and trout on the River Exe. The fishing can be on a purely guided basis or with instruction on casting and fishing techniques if required. The river holds a good head of wild trout, with excellent runs of salmon given the right water conditions. The water also holds some decent grayling. Being a spate river, the water levels can rise rapidly and may become un-fishable. If this occurs I can offer still water fishing as an alternative, should you desire. Prices – £150 a day or £85 a half day. So if you fancy catching some wild fish on the river, please get in touch to book a guided session with me.